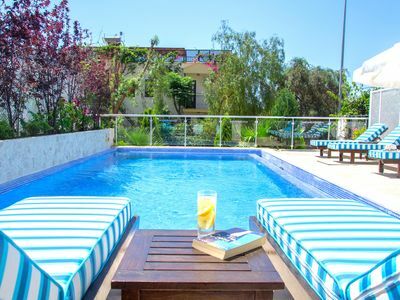 Melissa 17 is situated on the exclusive 5 star Flamingo Country Club comprising of beautiful villas and apartments with views to the sea, lake and mountains of the Bodrum peninsula. This ground floor two bedroom family apartment has a fully fitted kitchen,dining area and beautiful lounge area which opens onto the patio boasting stunning views of Lake Tuzla and the mountains beyond. The resort is just a few minutes walk from neighbouring sister resorts of Turquoise and Royal Heights and nearby shops,supermarket, bars and restaurants as well as its own private beach club. For the keen golfer the complex has a challenging 6 hole Pitch & Putt course on site and is only an 8Km /10 minute drive to the Vita Park Golf Resort which boasts an impressive Par 71 Championship Golf course. Turkey's Aegean coast is beautiful, historic and agriculturally rich. The most spectacular of the classical sites are along the Aegean Coast, stretching from the northern border with Greece south to Bodrum. The treasures include the 3,000-year-old ruins of Troy, made famous by the poet Homer; the ruins of the fabled city of Pergamum, on its windswept hilltop; and the magnificent temples, colonnaded streets, the theatre in Ephesus and the historical site of Pamukkale. The ancient city of Ephesus (Turkish: Efes), located near the Aegean was one of the great cities of the Greeks in Asia Minor. In ancient times Ephesus was the home of the Temple of Artemis, one of the Seven Wonders of the World. Today, the ruins of Ephesus are a major tourist attraction and remain a sacred site for Christians due to its association with several biblical figures, including St. Paul, St. John the Evangelist and the Virgin Mary. An unusual natural and historical site with the sparkling white castle -like cascades, Pamukkale is one of the most important highlights of Turkey, unique in the world. The site is named in Turkish as "Pamukkale", that means "cotton castle", parallel to the glorious and spectacular view of the site. The dazzling white calcareous castles are formed by limestone-laden thermal springs, creating the unbelievable formation of stalactites, potholes and cataracts. Constructed between 1406 & 1522 by the Saint Jean knights on Zephia Island, as a result of their original castles in Izmir, Girit and Istankoy, being destroyed by Tamburlaine Khan (the Turkish supreme ruler of Tatar tribes). The castle is now a museum and was officially opened in 1961. .
You can take your pick for top nightspots. Wander along Bar Street and go into whatever takes your fancy. Trends change and what is hip one week may not be the next. The best bet is to follow the crowds if a bar or club is busy that usually means a good night can be expected. Try the Queen Vic, The Shamrock, Victoria Bar, Beach Club and Heart Beat Disco. Bars are open from midday until the small hours. Located in Mandalya Bay on the Aegean Sea, also known as the 'Turquoise Coast', Gulluk is foremost an unspoilt fishing port north of the Bodrum Peninsular. 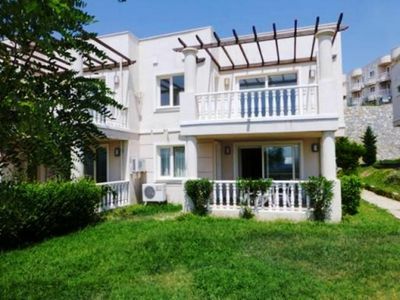 Only 10 minutes from the International Bodrum – Milas Airport, ten minutes from the main road to Milas (15K) and Bodrum (45k) There is an abundance of fish restaurants serving locally caught sea bass and bream, cafes and eating houses. In addition there are several supermarkets, hotels, and banks plus a multitude of local shops and businesses. In the deep natural harbour of Mandalya Bay lies the traditional fishing village of Bogazici This is the unique point where Tuzla lake unites with the sea in the gulf of Gulluk. As well as an abundance of wildlife Tuzla also holds an important place in history Ruins of the ancient city of Bargilia including a Roman Temple can be seen scattered over this area of breath taking beauty and calm. Today several fish restaurants fringe the sea front of Bogazici offering the days fresh fish while original stone houses line the road and testify to the Turkish traditional life. 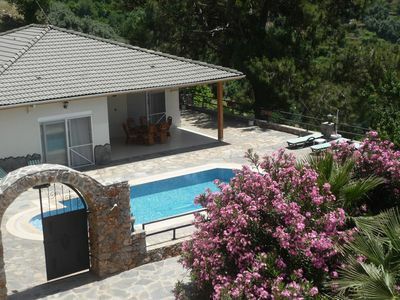 The area covers 380 hectares it is famous as a natural sanctuary for birds and the paradise of flora and fauna especially in the spring Protected by hillside covered with olive groves Pine and Tamarisk trees the sweeping wetlands are formed by the inlet from the Aegean Sea. Tuzla Lake has been a nature reserve under international protection since 1994. A huge variety of birds take sanctuary here in the rich wetlands. Greater flamingos flock to the area by the thousand and you can also see the largest population of White Storks in the region. Pelicans are also frequent visitors. Among other species you can spot are the Heron, Mallard, Water Chicken, Grey and Hungarian Duck, Swallow, Great White and Little Egret Butterflies. 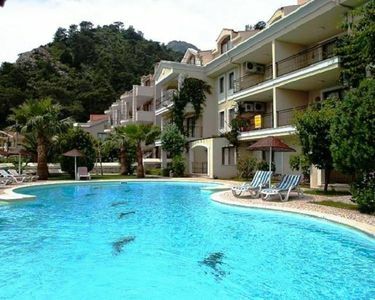 Rental 2+1 Aparts in Fethiye Calis in a Complex Shared Pool Lighthouse 4. Close to the center, up to 5 people 2 + 1-day rental apartments with a private beach.